One of the best things about the car scene in Japan is no matter where you are, if you’re bored there’s usually a car meet happening somewhere at any given time. While most meets tend to happen at night, primarily at the Daikoku and Tatsumi Parking Areas, it’s also worth stopping by during the day. As I’ve mentioned before, places like Daikoku and Daikanyama have regular Sunday morning meets where people come and go as they please. Tatsumi is perhaps a less known daytime meeting area but it’s worth a visit after you’ve had your fill at Daikoku. It is better to visit on a weekend. Sundays are best, but there’s still some cars there on a Saturday. What I usually do is after I’ve finished up at the Daikoku Sunday morning meets is I make a stop at Tatsumi PA before returning back to Tokyo. Also, I cannot stress enough that Tatsumi PA is impossible to get to on foot. You can try but you’ll just end up on the normal road beneath the overhead motorway where Tatsumi PA is located. Your only chance of going is with a car, so find a friend with one or rent one for a day or two to check out some meets. The differences between the atmosphere at Tatsumi is, well, night and day. Most people know of the Tatsumi night meets as being hectic ones that fill up quickly. More recently the police have been shutting down the meets around 10-11 p.m. While it’s nowhere near as big as Daikoku, it still gets a lot of negative attention for being so close to residential areas. During the day you get a different crowd. Set against the backdrop of typically grey high rise apartments, the bright yellow windows that make Tatsumi distinctive at night give it a different charm during the day. Seeing an eclectic mix of cars parked up under the sun with a rather ordinary background always gives me a zen-like satisfaction. I still maintain if you want to see diversity, Daikoku is the place to go. You’ll get everything there from old school JDM cars and lowriders to the newest exotics in one place. Tatsumi during the day is less flashy, but arguably just as crazy. As you’ll see from the photos most of the cars are European supercars, but because it’s Japan, they’re not just any ordinary supercars. Take this Artega GT as an example. A quirky sports car from Germany, the GT used Volkswagen parts and was only in production between 2009-2012. There aren’t too many of these around so it was surprising to see one just casually roll up to Tatsumi on a random Sunday afternoon. Same goes for the white Ginetta G12, which is basically a competition version of an already light car. It wasn’t only just small and light but also incredibly loud and bore semi-slick rubber. The fact it’s registered within Tokyo made it even better. But that’s nothing compared to the pair of Tommykaira ZZs that showed up once. Admittedly, my knowledge of these cars is only limited to the Gran Turismo games. Even by Tokyo’s standards these aren’t a common sight, a fact that was very apparent when a few of the Porsche and Ferrari owners went to have a closer look at them. 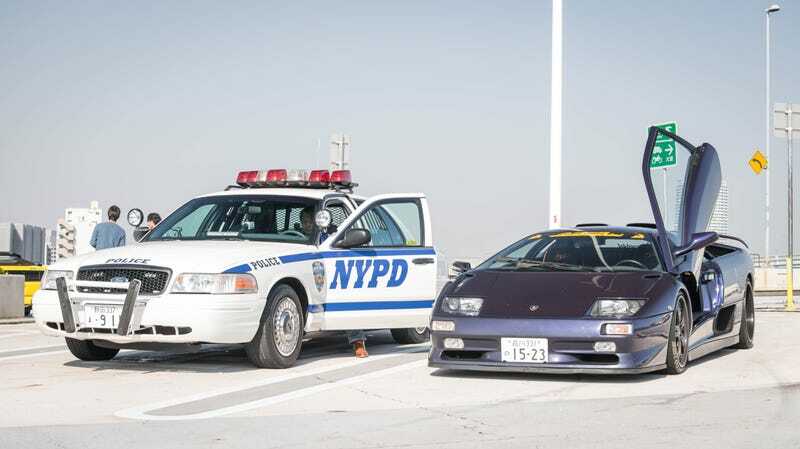 Other oddballs include an orange TVR Tuscan and a NYPD Crown Vic. That owner goes to meets regularly so there’s a good chance of seeing him around. He usually parks next to a Humvee but in this case I guess the purple Diablo SV had to do. Tatsumi during the day isn’t exempt from the quirky and oddball supercars and modified ones either. The cars here were seen from various meets on Sunday afternoons over several months but you’ll be able to see anything from a “Racing Countach,” a Liberty Walk Lamborghini Aventador with a carbon fibre wrap, a RWB Porsche 911, or some kind of widebody Nissan GT-R. If classics are more your thing then you won’t be disappointed. Compared to the night meets at Tatsumi, there are more classics here during the day. Cars like the BMW 3.0 CS, Honda NSX, Alfa Romeo SZ, and Porsche 356 can be found here. Ah yes, Porsche. On most weekends it’s very common to see a plethora of Porsches parked at Tatsumi. You get few Cayman GT4s or a 918. However most of the Porsches you’ll see will be different variations of the 911. From a bog standard Carrera to a GT3 RS with Pokal wheels and everything in between, Tatsumi has you covered. It’s not uncommon to see rare versions such as Carrera RS, GT2s, and the 50th Anniversary here either. Actually, the 911 50th Anniversary, black Alfa Romeo 8C, and the white 1M Coupe are all owned by the same guy. Tatsumi, much like Daikoku, gives these owners a chance to take their cars out on smooth open roads. You don’t see too many of these high-ticket classics driving around Tokyo as most of the people who own are quite old and probably don’t want to deal with regular traffic. There aren’t too many Japanese cars that come to Tatsumi during the day, they usually save that for the night meets. However there were times when a few GT-Rs showed up, along with one of the more outrageous Toyota Supras I’ve seen, and a Lexus RC F with a rather amusing number plate. The meets here aren’t officially organized. There’s no guarantee what will be there or what will show up but it’s worth sticking around as even during sunset cars still come and go. Plus there’s a rather nice view there. Hell, even as you leave you might still see some rare and interesting cars out on the motorway back into the city.